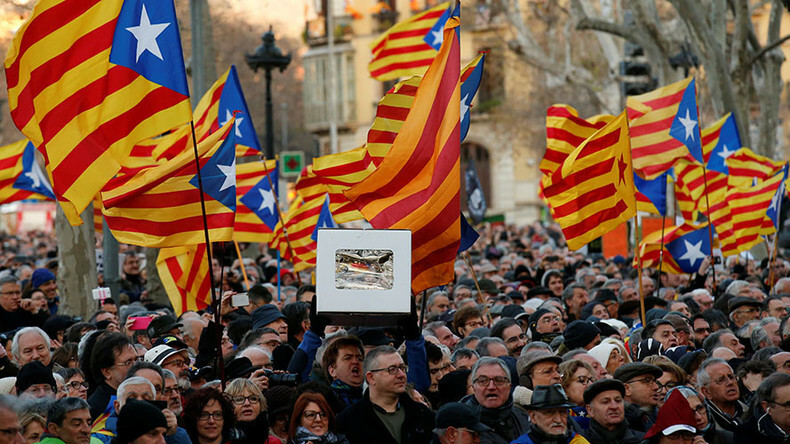 Thousands of Catalans have taken to the streets in support of revered former leader Artur Mas, who faced court on Monday over a symbolic non-binding independence referendum held in 2014. Mas served as Catalan president from 2010 to January 2016, when he stepped down in the hopes that pro-independence parties could form a new coalition. According to Catalan News Agency (CNA), a crowd of about 40,000 people gathered on Monday in downtown Barcelona to show their support for Mas, as well as former Vice-President Joana Ortega and former Education Minister Irene Rigau. All three stand accused of civil disobedience and staging a 2014 informal referendum on independence in breach of a legal order from Madrid. 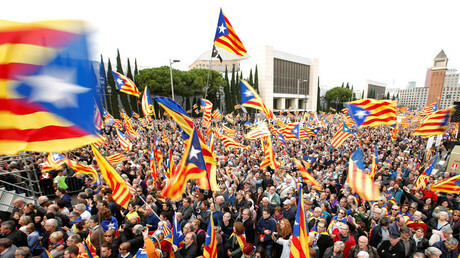 Mas’s supporters shouted “independence, independence,” “down with Spain’s justice system,” and “we want to vote” as they lined the avenue in front of the courthouse where the trial is taking place. The three defendants stood on the steps to greet their supporters, who held up banners that read “We are all 9-N,” in reference to the 2014 referendum, which was held on November 9. If convicted, Mas could face a decade-long ban from politics. “Today, many of us feel as if we're being tried,” said the Catalan regional government president, Carles Puigdemont. “On the 9-N, 2.3 million people expressed their opinion on the relationship between Catalonia and Spain in a consultation, which responded to the compromise between citizens and their representatives,” he went on, as cited by CNA. “Many of us feel tried today, and thus we will show our outrage over what we consider a political trial. “A country which is able to hold a consultation such as the 9-N has a healthier democracy than that of a country which puts on trial those who made it possible,” he told the crowd. On Sunday, Mas himself addressed the issue with reporters. “We are determined to go forward. We did what had to be done in 2014 and we would do it again if the circumstances allow it again,” he was quoted as saying by AFP. In November 2014 Catalans held a massive, symbolic regional independence vote, in defiance of the Spanish government’s ban. 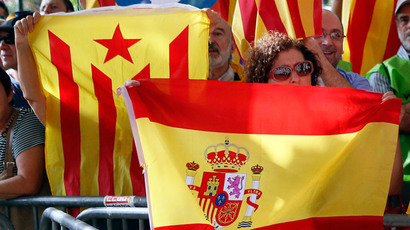 An overwhelming majority, 80 percent, said “yes” to independence and secession from the central Spanish government in Madrid. Some 5.4 million of the 7.5 million residents of Catalonia took part in the vote, according to the authorities. Historically Catalonia, which already enjoys significant autonomy from Madrid, has been one of Spain’s better-off regions and many of the local population resent having to send taxes to the capital to help support poorer areas of the country. Catalonia accounts for one-fifth of Spain’s economic output, and has had no problem in attracting foreign investment, which grew by 31.5 percent in 2013 according to figures from Spain’s Economy Ministry.